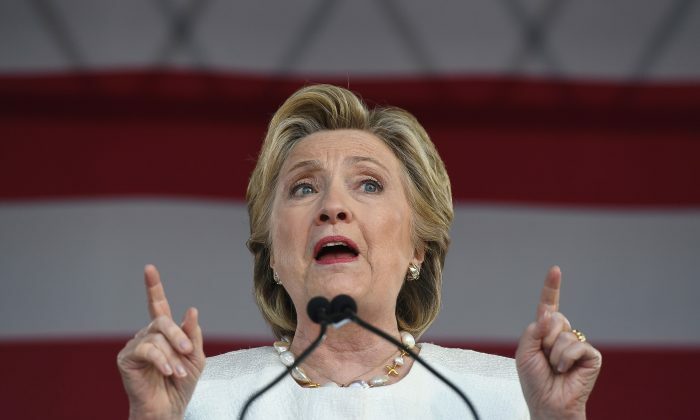 Former Secretary of State Hillary Clinton’s efforts to keep her emails exempt from Freedom of Information Requests have instead turned them into a top target for political opponents and watchdog groups. Clinton used a private email server in her home to host her personal email account, an evolution of a strategy previous secretaries of state used to avoid Freedom of Information Act disclosure requirements. While her predecessors used private emails, Clinton went one step further by hosting her private email on a server in her home, giving her further control over what emails could be obtained through congressional subpoena. Judicial Watch recently released 448 pages of documents from the U.S. State Department containing emails that reveal Huma Abedin, deputy chief of staff to Clinton, provided special State Department treatment to major donors to the Clinton Foundation and political campaigns. The released documents also further reveal Clinton’s established practice of overlooking security implications of sensitive documents, a pattern revealed by earlier leaks as well as an FBI investigation. The heavily redacted documents from Abedin’s nongovernment account reveal that Clinton’s brother, Tony Rodham, acted as a go-between for a Clinton Foundation donor, Richard Park, who also donated a $100,000 to former President Bill Clinton’s campaign in 1993 and is listed by the Clinton Foundation as a $100,000 to $250,000 donor. Park used Rodham to pass at least one personal message to Clinton. Other emails show Clinton Foundation executive Doug Band instructing Abedin to “show love” to Clinton donor Andrew Liveris, the CEO of Dow Chemical. Dow gave between $1 million and $5 million to the Clinton Foundation and Clinton Global Initiative, notes Judicial Watch. Band also pushed Abedin to have Clinton do a favor for Karlheinz Koegel, whose company Media Control Gmbh gave Bill Clinton a $250,000 honorarium in 2008. The emails reveal Koegel wanted Hillary Clinton to give the “honor speech” for his media prize to German Chancellor Angela Merkel. A few months later in August, Band emailed Abedin about someone who wanted to be ambassador to Barbados. “I know, he’s emailed a few times. But she wants to give to someone else,” Abedin replied. Six of the email exchanges released by Judicial Watch were not previously turned over to the State Department. They are added to at least 433 other emails that were left out of the 55,000 pages of emails that Clinton did turn over to the State Department. “A number of emails show the free flow of information and requests for favors between Clinton’s State Department and the Clinton Foundation,” notes Judicial Watch. Emails that passed through Abedin’s unsecured personal account include discussions of Libyan President Moammar Gadhafi, the planned whereabouts for President Obama, and Clinton’s own detailed daily schedule for July 15, 2009. Judicial Watch President Tom Fitton said the emails reveal a pattern that should prompt an official response. “I’m not sure how much more evidence of pay for play, classified information mishandling, and influence peddling from Clinton’s email server one would need to show a serious criminal investigation is required,” he said.